Something new and important is afoot. Nonprofit and philanthropic organizations are under increasing pressure to do more and to do better to increase and improve productivity with fewer resources. Social entrepreneurs, community-minded leaders, nonprofit organizations, and philanthropists now recognize that to achieve greater impact they must adopt a network-centric approach to solving difficult problems. Building networks of like-minded organizations and people offers them a way to weave together and create strong alliances that get better leverage, performance, and results than any single organization is able to do. "The case for how networks can be uniquely leveraged to work in hyper-complex situations—offering a nimble and expansive approach—helps readers see how taking the leap into a network way of working can yield big impacts." "We are living in a world where social change is about working networks, not about building organizations, especially if you need to work with Millennials. This book is a must read for anyone working in the nonprofit sector and wants to achieve more impact. The authors have done an amazing job overviewing the trends and offering valuable practical insights about how to build networks for social change—from design and connection to results." Beth Kanter, coauthor, "The Networked Nonprofit" and "Measuring the Networked Nonprofit"
Morley Winograd, coauthor, "Millennial Momentum: How a New Generation is Remaking America"
David Osborne, coauthor, "Reinventing Government" and "Banishing Bureaucracy"
“Though we know, deep in our bones, that we’re better together than alone, most of us don’t know how to activate or even initiate strong, effective networks. Plastrik, Taylor, and Cleveland have spent the better part of their careers studying and trying to remedy this problem, and to great effect." 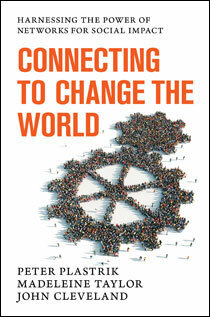 "...may well be the best guide for practitioner[s] to date...comprehensive...[Connecting to Change the World] is a significant contribution to the field of social change." In the early life of a network—the first year, say—how can you tell how well it’s doing? Right off the bat there’s observation: what does a network gathering look like, feel like, sound like? I’ve been in network annual meetings where newcomers to the network were astonished about how much energy and exchange network members put out—and the sheer amount of noise in the room. Even more astonishing, the members maintained a high level of energy for day after day. At the end, maybe they were exhausted—but during their time together they were passionately committed to giving and getting as much as they could. Hidden in all that energy is a clue to what you’re really looking for if you want to gauge the network’s condition. It has to do with what makes a network tick, as we explain in chapter 1 of Connecting: two social dynamics—reciprocity and shared identity—emerge and are amplified by the network’s decentralized structure. Reciprocity is a behavior, but it is driven by an emotion: a commitment to the success of others on their own terms. In a strong network, members don’t just know each other well, they are committed to each other’s success, and will take action on behalf of others. When you survey network members ask them how committed they feel they are to the success of other members and how committed they think other members are to their success. Shared identity is also a feeling, a sense of common cause, mutual interest, alignment, and of belonging to something—literally, being a member. When you survey members ask them how much they feel they are a part of something larger than themselves, something communal. In a network’s start-up phase, it takes time for members to develop a deep commitment to others in the network and a feeling of belonging and alignment in the network. But its emergence is what network builders should be watching for. Peter Plastrik is cofounder and Vice-President, Innovation Network for Communities (INC), a nonprofit national network of community system innovators. A prolific author, Plastrik wrote Banishing Bureaucracy and The Reinventor’s Fieldbook with coauthor David Osborne. He is the coauthor of Connecting to Change the World: Harnessing the Power of Networks for Social Impact. Stages of Evolution—from Emerging to Developing to Near Mature to Mature. Network Conditions—Connectivity, Leadership, Activities, Communications, Coordination, Member Satisfaction, and Resources. Leadership evolves from “Two or more committed founders” (Emerging Stage) to “Second generation of leaders who create annual strategic plans” (Mature Stage). Member Satisfaction evolves from “Most members see opportunity but network not yet delivering.” (Emerging Stage) to “Broad, high level of member satisfaction by a majority of members” (Mature Stage). When Maggie assembled a composite picture of the eight networks using the assessment matrix, it showed quite clearly that (a) mostly the networks were in the Developing Stage on nearly all of the conditions, except Activities and Communication, and that they were lagging in the Resources condition, “stuck” as it were in Emerging and Developing Stages. This mapping resulted in a set of recommendations that Maggie developed for the networks. Here’s the Network Evolution Assessment tool. Cross-posted from the Connecting to Change the World blog with permission. We’re often asked about the design of network governance. A funder of several networks asked what the best form of governance is. A builder of a national network asked what governance model would help his network’s nodes (clusters of businesses in multiple cities) to feel “ownership” of the national network. The designer of a “new economy” type of community development strategy that needs 100s of local and regional organizations across public, private, and nonprofit sectors to align around a strategic plan asked what their governance model should be. Reply in all cases: there isn’t one best governance model for a network; governance has to be customized to the network due to many factors we detail in chapter 2 of Connecting. There are many possible things that a network’s governance might have to decide and there are many different ways to make decisions But there’s more advice I add: Don’t jump to the assumption that “our network needs governance” just because there are decisions to be made. The purpose of governance is to enable network members. What is it you’re trying to enable that isn’t getting done in the network? Why isn’t it getting done? For many funders what’s not getting done is the development of a network plan and tight management of network resources. A certain governance structure might make the funder happier, but will it enable the network’s members to plan together and manage their resources better? If a network’s nodes aren’t interested enough in the network’s existence, will building a governance structure enable them to become more interested, or will it just feel like another thing that isn’t compelling to them? If a network’s members are supposed to align around a single strategic plan that coordinates them, a governance structure may well be able to make decisions and push implementation of the plan, but will it build the relationships among the many members that enable them to align deeply and sustainably? Design a network’s governance cautiously, focusing on what really needs to be governed, not on some feeling (perhaps a vestige from organization-centric thinking) that governance is needed.